Alan Vauls who was sent off in his debut for Portstewart on Saturday.PICTURE MARK JAMIESON. It’s been rocky few years for Coleraine lad Richard Vauls. The 24-year-old has been out of football for almost 18 months due to a broken ankle, but he was back on the pitch on Saturday and played a key role in Portstewart’s 3-2 win over Dundela in the Irish Cup. Richard sustained the injury whilst he was a player at Ballymena United, Richard also had a break spell under Oran Kearney at the Showgrounds. 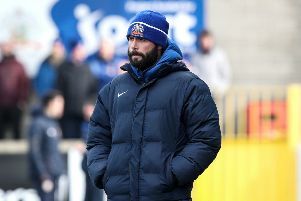 When Richard’s contract with Ballymena ended at Christmas, he made the decision to sign for Portstewart, having trained with Gary Taylor’s side in a bid to get fit again. Richard is the son of former Portstewart player Alan Vauls. “I had been in a bit of a rut before the injury, my head just wasn’t in the right place,” he admitted. “The year out really helped me, and I am hungry for the game again. “I had a really good feeling before Saturday’s game, I had that buzz back that you get before a match. “I really enjoyed being back playing again. It wasn’t the debut that Vauls could have hoped for, he given a second yellow card ten minutes from time. “I was disappointed in myself, but that’s just one of those things. “All of the boys were delighted with the result. “I had said to my dad earlier in the week that I had a good feeling about the Irish Cup game, and we proved that. Looking ahead to the clash with Portadown, the Bushmills Distillery worker added: “We couldn’t have asked for a better draw. Looking to the future, the Coleraine lad added: “Obviously I want to be playing at a higher level, and hopefully I will do that.